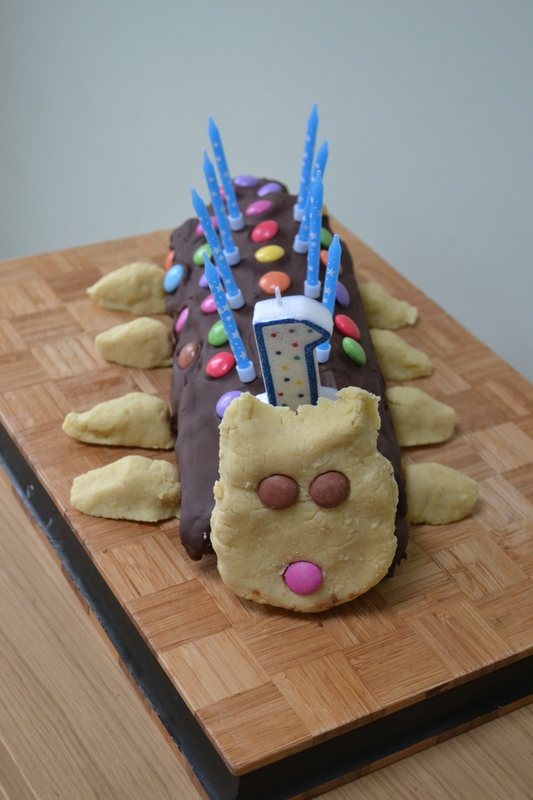 Colin the Caterpillar Cake for Seb’s 1st Birthday! 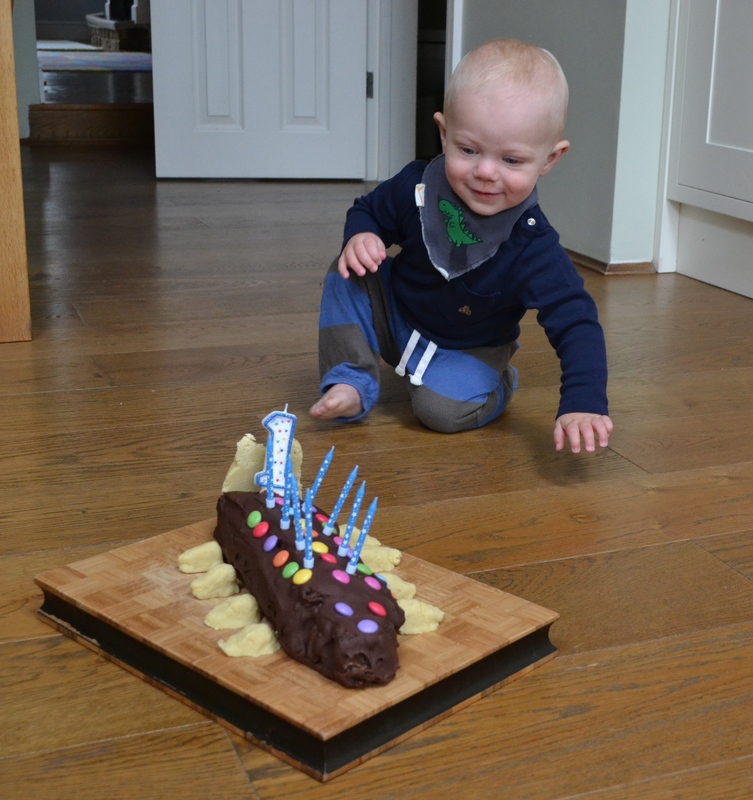 I had so many different plans for what I could bake for Seb’s first birthday. I’d been thinking about it for ages in fact and changed my mind weekly as to what I could conjure up for him. Of course, what I had to remember is that he doesn’t even know it’s his birthday. I think it’s safe to say that 1st birthdays are more about the parents and family than the birthday boy. I’ve tried baking some cakes for Seb in the past. All being healthy sugar free cakes with the sweetness coming from ripe fruit mainly in the form of bananas or dried fruits. So far he’s tried apple and sultana loaf, banana bread and last week he tried carrot cake. I can’t say he’s been overly fussed by any of them! Give him a banana, some sultanas or a juicy ripe pear and he’s a happy man. I shouldn’t knock it really because as soon as he discovers the highs of sugar I’ll really be in trouble. However, the prospect of an unfussy birthday boy wasn’t going to stop me baking him a lovely birthday cake for the big day. My first idea was one of those ‘hidden smarties cakes’ that looks suitably impressive for a birthday. And then I thought I should be baking something around what he was ‘in to’. Other than stacking cups and his walker, he’s obviously far too young to really be into much at all. I was all set to go down the stacking cups route, I even told people that’s what I’d be making, but to be honest, all that fondant was really putting me off. For one thing, I don’t like eating the stuff. Sickly sweet and lacking in flavor just isn’t what I look for in a cake. And if Will and I are going to be the main participants in the consumption of this cake, then I might as well make something that’s a bit more to our tastes Plus, I really don’t have a lot of artistic skill so the prospect of carving up cake to look like stacking cups became increasingly unappealing. I needed to get my thinking hat back on. We have a tradition in the ‘Smith’ family, I can’t even remember when it started to be honest but the birthday cake is always a ‘Colin the Caterpillar cake’. 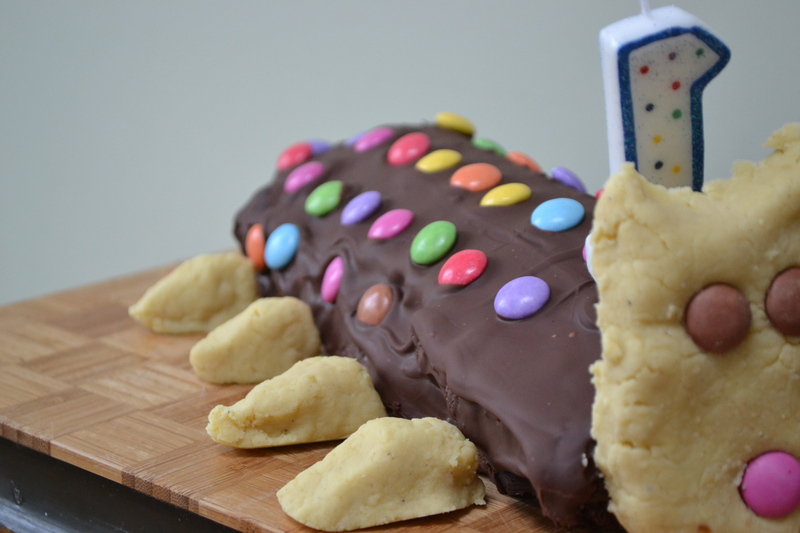 Even if there is a freshly baked birthday cake, there is still a ‘Colin the Caterpillar cake’ on offer too. I have no idea why the tradition started beyond the obvious of rich indulgent chocolate sponge, covered in crisp milk chocolate with a sprinkling of smarties for good measure on top. It’s the perfect size for a large family, easily cut into even slices to prevent the argument over who gets the bigger piece. Of course there is the usual fight over who gets the face because it means you get to enjoy some extra thick white chocolate, but ‘normally’ the birthday boy / girl gets first dibs. 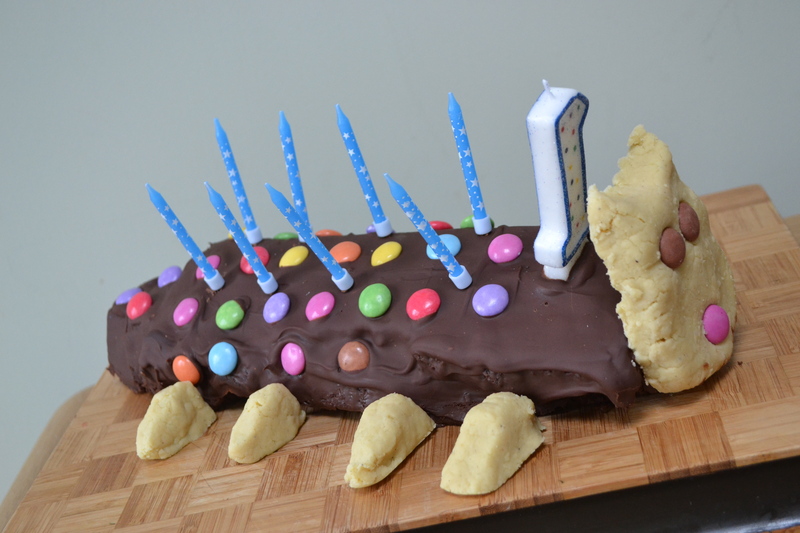 I’d seen a picture of a homemade ‘Colin the Caterpillar’ cake on the lovely ‘Little Loaf instagram account’. You might have noticed I’m a little obsessed with the Little Loaf blog. Kate produces such amazing baking masterpieces that it only inspires you to have a go yourself, even when you know yours will never come close to looking as impressive as what she conjures together. There was however a slight issue, the recipe wasn’t on her blog. It is in fact in her new cookbook, ‘Homemade Memories’ coming out after Seb’s birthday. After a tweet for help and a few emails later, she kindly shared her recipe but with a promise in return not to print it as her book isn’t out till the following week. Whilst my attempt doesn’t look nearly as impressive or slick as the original, I think the taste was pretty divine. It had the lightest of chocolate sponges, held together with a hazelnut chocolate cream that Will described as creamy Ferrero Rocher encased in a crisp chocolate shell. 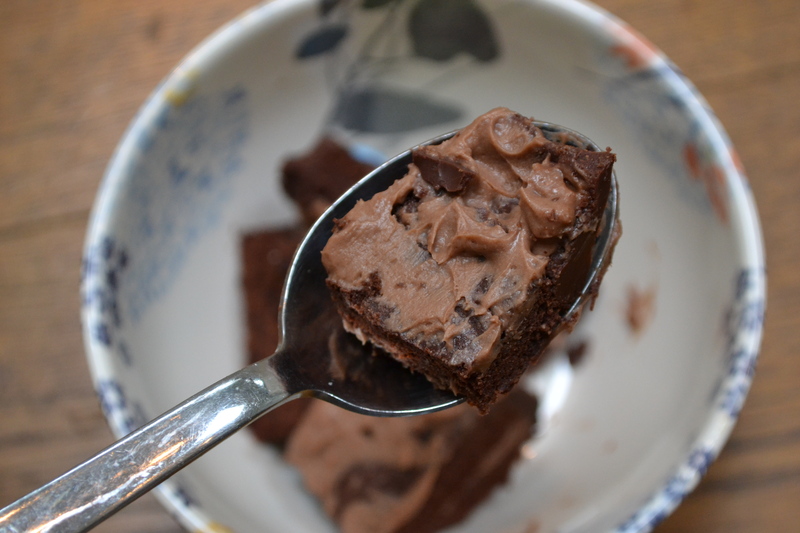 It really is a heavenly triple chocolate cake! I struggled with the caterpillar face… which is obvious by my rather inartistic attempt, but I’d never had a go at making modeling chocolate before but I feel now I have a better understanding and would be a little more successful next time. I might have even mastered it by the time Seb turns 18 and I wheel the cake out at this big birthday bash! So there is no recipe this week (I couldn’t not keep my promise) but I can only encourage you to go and order Kate’s book like I have. If her blog is anything to go by then the cookbook will just be fantastic. p.s. This is also my 100th blog – seems sort of appropriate! This entry was posted in Baking, Cake, Desserts, Recipes and tagged Cake, Chocolate, Ferrero Rocher. Bookmark the permalink. 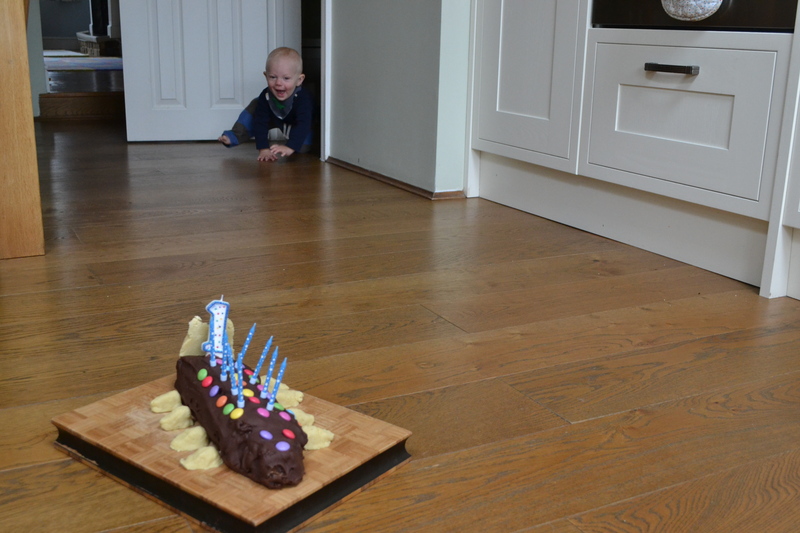 3 Responses to Colin the Caterpillar Cake for Seb’s 1st Birthday!